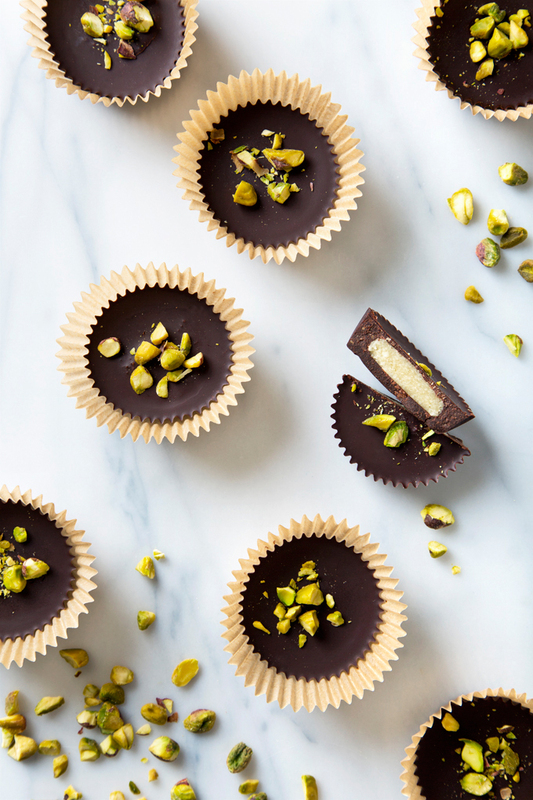 “Rich dark chocolate cups with a sweet homemade marzipan filling, topped with chopped salted pistachios.” This is the recipe I’ve had in my head for the last year and I finally made it a reality, just in time for Valentine’s Day! I kept pushing the idea aside in favor of recipe requests, sponsored work, and other things I knew would probably perform better on Google and Pinterest, etc. 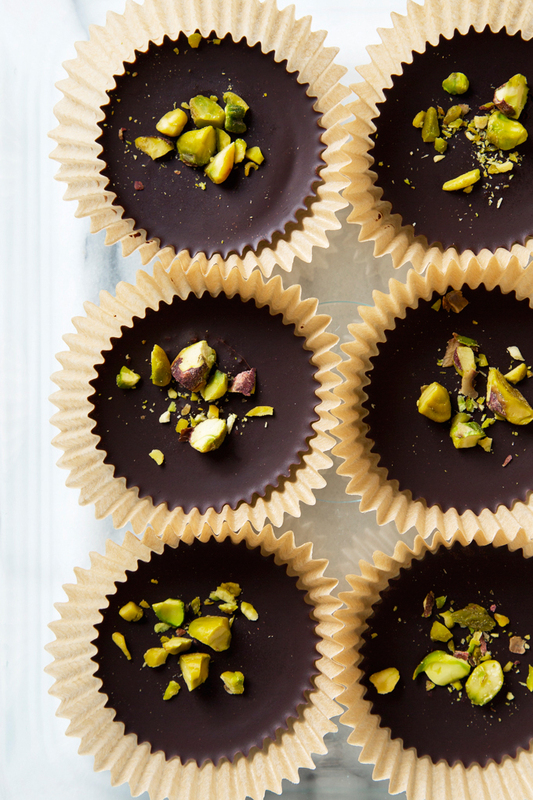 So these dark chocolate cups…these are really just for me (and for you, if you’d like to make them to enjoy along with me). It’s a shame it took me so long to make these because the flavors, as I expected, are phenomenal together. The homemade chocolate shell is extra dark and a little bitter, which is such a nice contrast to the sweet marzipan filling and crunchy, salted pistachio topping. If you’re new to the wonderful world of homemade chocolate, you’re in for such a treat. I know from personal experience that it can take a little while to work up to spending the money on good quality raw cacao butter, but rest assured— it’s money well spent. The chocolate it creates is ridiculously silky and smooth, and you can use whichever sweetener you prefer (I usually opt for powdered coconut sugar). The coconut sugar doesn’t completely dissolve into the chocolate, though I don’t mind the extra bit of texture because it reminds me of stone ground chocolate. 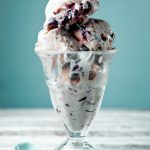 That all said, if you’re not up for making your own chocolate this go-round, you can certainly melt down your favorite dark chocolate chips or bars instead. I highly recommend chopping up this 77% bar (you’ll need 1 cup of melted chocolate). 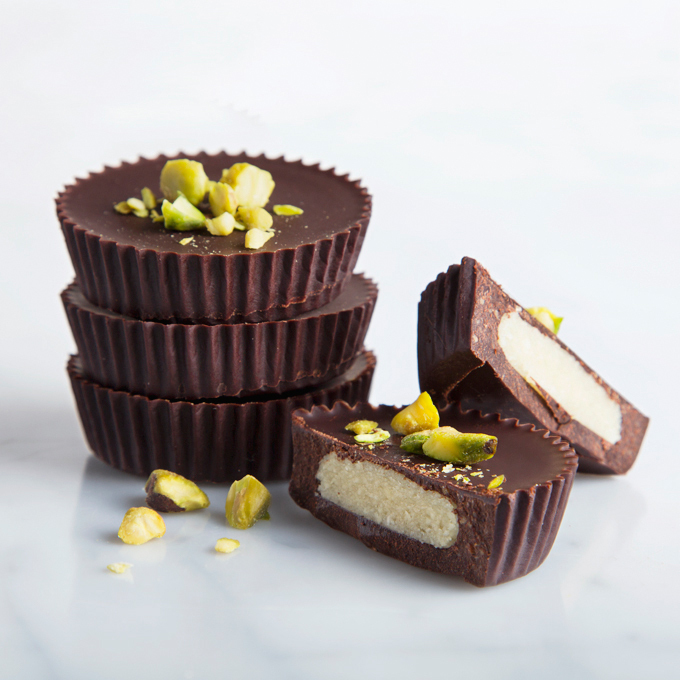 Rich, dark chocolate cups with a sweet marzipan filling, topped with chopped, salted pistachios. 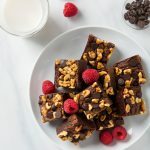 These extra decadent treats are pure bliss and they're so easy to make! Make the marzipan: place the almonds in a food processor and process until fine and crumbly (about 30 seconds). To the food processor, add the agave nectar, almond extract, and salt, and process until the mixture forms a ball on the blade (about 1-2 minutes, depending on your processor). You may need to scrape down the sides of the bowl once or twice. Make the dark chocolate cups: Line a muffin tin with 12 paper liners and set it aside. Add the cacao butter to a medium saucepan and melt it over the lowest heat setting. Once melted, whisk in the cacao powder, powdered coconut sugar, and salt until combined. Turn off the stove and spoon approximately ¾-1 tablespoon of the chocolate into each muffin tin. Place the muffin pan in the freezer for 10 minutes to allow the chocolate to firm up slightly. Once the chocolate base is mostly solid, spoon about ½ tablespoon of the marzipan into each of the tins. Tip: use your hands to form it into flat patties so that the next layer of chocolate goes on smoothly. Cover the marzipan with another ¾-1 tablespoon of the melted chocolate and return the pan to the freezer for 1-2 minutes. This should be enough time to partially solidify the chocolate so that the pistachios don't sink, while still leaving it sticky enough for them to stick to the chocolate. 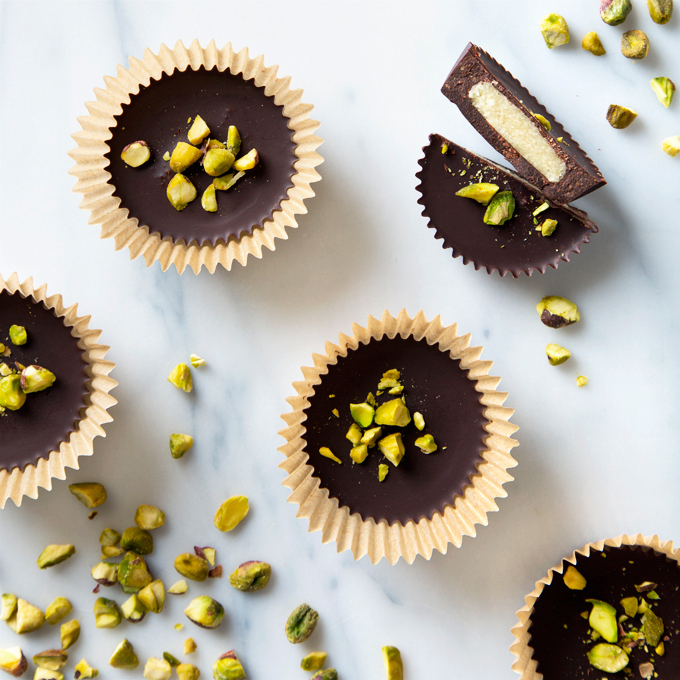 Sprinkle the marzipan cups with chopped pistachios and place them back in the freezer for 15-20 minutes, or until the chocolate is completely solid. Transfer to an air-tight container and store them in the fridge. Almond extracts can vary depending on which you use. I used the Whole Foods Organic 365 brand for my marzipan. I recommend adding it in ½ teaspoon increments and tasting as you go to achieve your ideal almond flavor. Same goes with the agave—taste as you go and feel free to adjust the sweetness to your preferred taste. I prefer to use raw cacao powder for flavor and health benefits, but cocoa powder also works. You will have leftover marzipan. 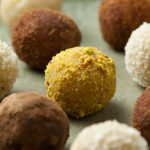 I recommend rolling it into marzipan truffles! If you prefer to use pre-made chocolate instead of making your own, simply melt enough to make 1 cup of melted chocolate. Oh my gosh, these are a thing of beauty! I love marzipan but normally can’t eat it because it usually contains egg whites. Thank you for vegan-izing it and covering it in chocolate – you just made my day! I hope you love these dark chocolate cups, Erika! I can’t stop eating them. Ha! I was JUST craving marzipan the other day, but like another person mentioned most has egg (and tons of white sugar). I’m so excited to try your healthier marzipan cups! Beautiful photos, especially the close up with the stacked cups. I bet the chocolate and marzipan combo is delicious! This si such a good idea! I love it. And the pistachios make everything pop, yummy! I made these a few days ago, and oh my! They are delicious and my blood sugar did not spike through the roof. My husband loves amaretto so he was in heaven. Excellent recipe and I will be making again!